A Splintered Mind: Musing Monday: Summer + Daughters = DISTRACTION CITY! Musing Monday: Summer + Daughters = DISTRACTION CITY! I mentioned to somebody yesterday that I was writing an eBook and they said, "What's that?" Their friend explained to them that it was an electronic book, but they were still a bit confused. I don't blame them. I'm confused almost every day. Take today. My girls are back with me for another two weeks of fun and splendor. We start off the morning with me in my bathrobe. And we finish the morning with me in my bathrobe. I'm still in it, actually. Somewhere in my morning I was supposed to get ready, but between trying to wake up the Leprechaun and answering the Goblin's incessant calls for attention with her Mii creations, I was lucky I managed to eat. "Daddy! Look at this! Hahahahaha! I made you fat!" "Daddy! Look! You look like a girl!" "Daddy? What do your eyebrows look like? Can you come here so I can see? Thanks!" Oh, I did manage to follow the Apple Keynote. Good thing that was on my ToDo list. I would hate to be unproductive after all. Now I need to find a job to afford all the nifty new toys they displayed today. And I'd like to work on that eBook thingie. One simply cannot put enough emphasis on the importance of finishing something guaranteed to draw blank stares. To put my morning back on track before the TV comes on again and the pandemonium of Daddy Duty flash grenades my attention span, I offer the following writing exercise. Some of you can even play along. Why should I be the only one making a fool of himself? 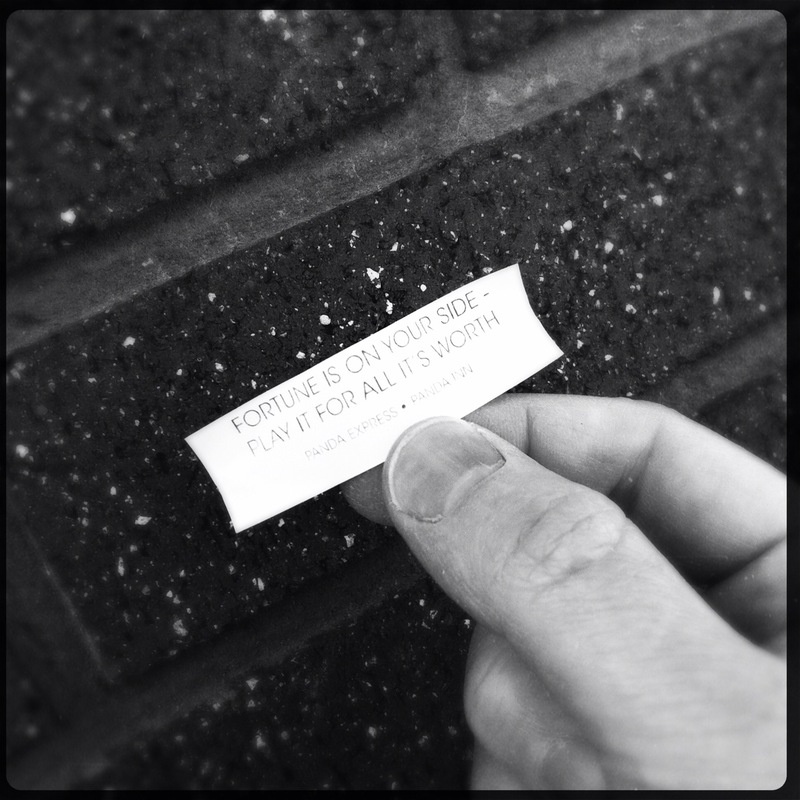 Today's photo theme: How would this fortune change this man's life? A cold wind blew from the north off the wall and pushed Glade's hair in the perfectly wrong direction, bouncing off his bald plate and flipping what was left of his youthful mane into his face. He pushed it back with an irritated flick of his head. Then he saw the fortune. All morning long he had been looking for a sign. Jenny had thought she had hid their savings account from him, but he had been too clever for her. He had spent enough time dumpster diving to know how to find a shredded bank statement in his own trash can. An hour and some clear tape later and he stood with the victory of his efforts in his pockets, $10,237 strong. He gingerly picked up the tiny scrap of paper. It was soiled with mud and baked by a brutal sun eager to blot out the message. "Fortune is on your side. Play it for all it's worth." Whether Glade would put the money back into the bank or invest in Rick's gluten-free puppy mill had been decided by a whim in the wind. For the first time in a sun's age, Glade enjoyed the wind pushing his hair this way and that. Come to think of it, that breeze sure felt good up there. He pushed his hair back with a smile. This project was bound to turn their fortunes around. He was certain Jenny would understand; she liked puppies.